p.s. I’ve also made a smile showing something (for a light skin). You’ll find it in the section with clean lines. Hello to everybody! I have much problems in my real life, that’s why I’m not often in Internet. So, I made a big amount of smiles for a light background. The most investigative visitors have already noticed it. But I had no time to write a news about it. I say it only now, but I suppose it’s never too late to mend. When I find time, I'll remake a couple of other smiles, because I was many times asked to do it. 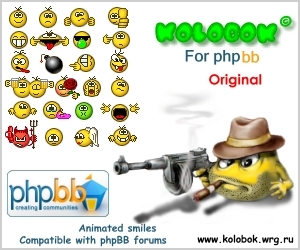 I got many letters, in which I was asked to explain, how my smileys can be installed in phpBB forums. Frankly speaking, I could hardly imagine, how it works, because I haven’t dealt with such forums. But yesterday I was looking for engines for the new forum and had a look at phpBB forum. I found no at difficulties in smileys’ installing, but taking into account the fact, that these forums spread free, I understood, that many administrators are unskilled and aren’t too good with the settings. I decided to help them and made a small archive of light smiles for such forums. Installation direction you’ll find inside the archive. Good luck! p.s. If you need smiles for dark skins, download them yourself and replace those, which are in the archive. The names of the smiles coincide. I had a good mood today. It resulted in a creation of a fully kolobok from the set: "I Am So Happy!". I put him in the Standard section. Russian branch of Siemens was forced into this odious court proceeding. According to the newspaper “Argumenti i Fakti”, Oktjabrski district court of Saint-Petersburg sustained a claim of 45 years old Victor Petrov from Gatchina against Siemens concerning infringement of copyright. Render time: 0.1309 sec, 0.0053 of that for queries. DB queries: 21.